Designhounds will be in Las Vegas for TISE 2018! 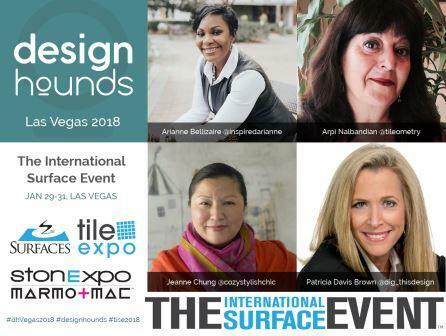 As trade show season kicks off, I have the great honor and privilege to be a part of Modenus’ Designhounds group during The International Surfaces Event (TISE) next week in Las Vegas. If you want to see what this distinguished group of high-rolling designers and bloggers are finding during this annual flooring show, then make sure to follow these hashtags on Facebook, Twitter and Instagram so you don’t miss a thing! Most importantly, please follow my fellow hounds Arianne Bellizaire of Arianne Bellizaire Interior, Patricia Davis Brown of Patricia Davis Brown Designs, LLC, and Jeanne Khoe Chung of Cozy•Stylish•Chic to see what new flooring design/product caught their discerning eyes! I’m looking forward to seeing old friends, and making new ones, during this event! And if you see me running around on the show floor, make sure to grab my attention to say hello! May your journey be safe, and your travels trouble-free. See you next week!